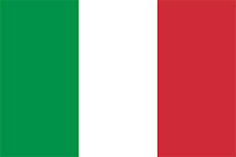 Italy is a south-central European country, whose boot-shaped borders extend into the Mediterranean Sea. The country’s historical cities, world-renowned cuisine and geographic beauty make it a popular destination for more than 40 million tourists each year. The nation is home to Mount Etna, Europe’s tallest and most active volcano, and houses two countries within its borders – the Vatican and San Marino.